Market Square are about to release a slew of new releases in 2017, the first being the brand-new 45 for UK based Garage band The Higher State. 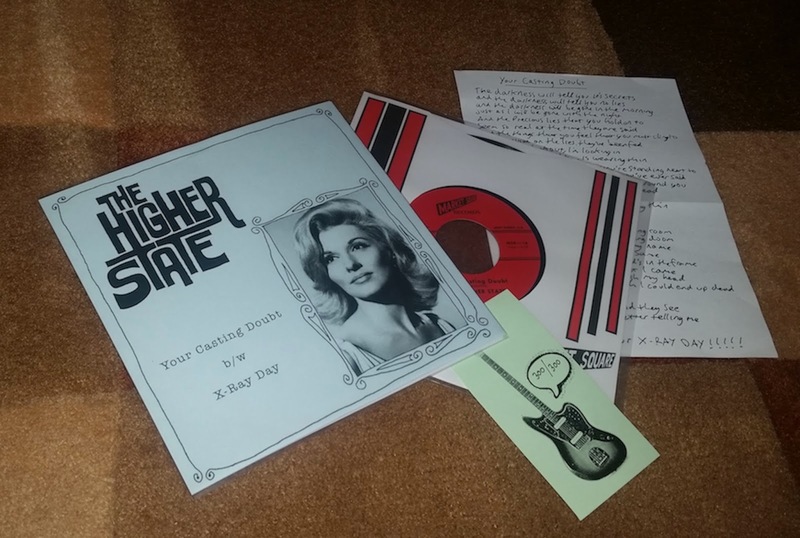 The Higher State have been making records now since 2005 and this release is their ninth 45rpm single, If you're into authentic sounding 60s garage styled punk rock, then you'd probably know who The Higher State are. 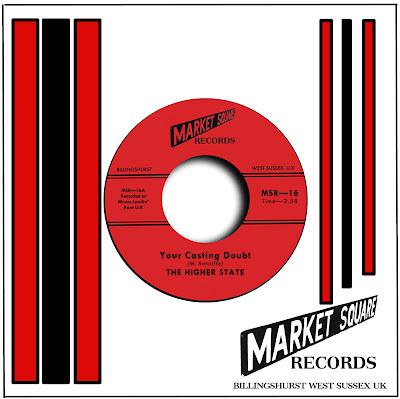 The A-side Your Casting Doubt instantly kicks the listener from a low gear stasis straight into the territories of tearing the skin against concrete at full speed, the opening snare drum snaps and the guitars pound followed by a swirling Farfisa organ which gains momentum throughout the track. The song breaks into an up and down wave of rhythm, beat and melody, building to further heights with rumbling bass lines and sharp lyrical observations regards to all those phonies and sell-outs which dwell in society today, such lines spat out with venomous precision include ".. And the precious lies that you hold on to, seem so real at the time they're said" and my personal favourite "You're as fake as the one you're standing next too and I see right through everything you've said"... NICE!!!! The track also has some soaring fuzz-tone guitar both in the lead break and the outro. The outro also including some pretty killer organ, drum and bass work too. Flip the record over and The Higher State have entered more moodier terrain with the b-side X-Ray Day; again the Farfisa organ floats gently whilst fantastic observational lyricisms are sung above a solid drum beat and some quite stead-fast guitar picking adding resonance to the vibe of the track.... everyday is your X-Ray Day, just remember that!!! Overall this 45 does indeed sound like some bored teenagers in some garage space in Fort Worth Texas circa 1966, but instead its some equally bored dudes in a stairwell in Kent. The 45 is limited to 300 copies and released on March 20th 2017. All the regular copies will come in a Market Square company sleeve; all the records come with a lyric sheet and a hand-numbered Fender Jaguar insert. Copies will also be found from the following outlets. As well as other record shops around the UK. In the meantime, why not check out the band's promo video for the single.